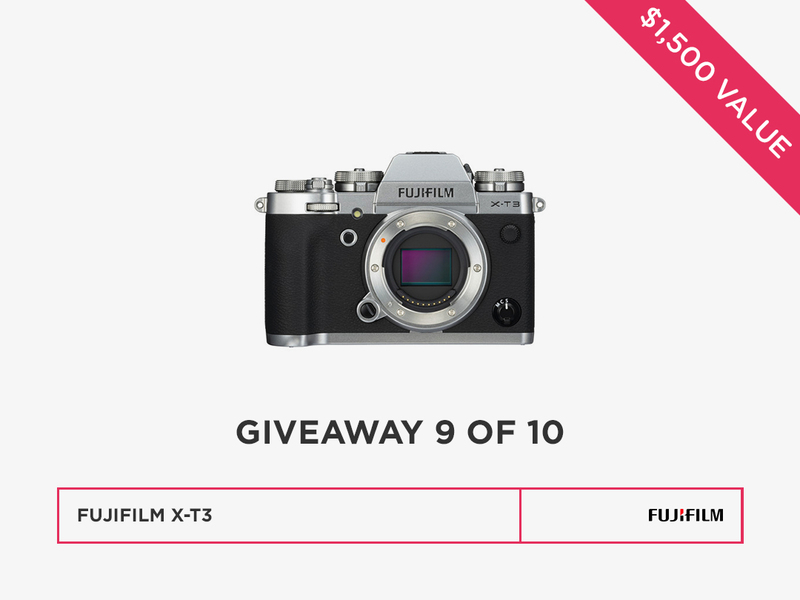 The team at Pixellu is so excited to bring you 10 Days of Giveaways! 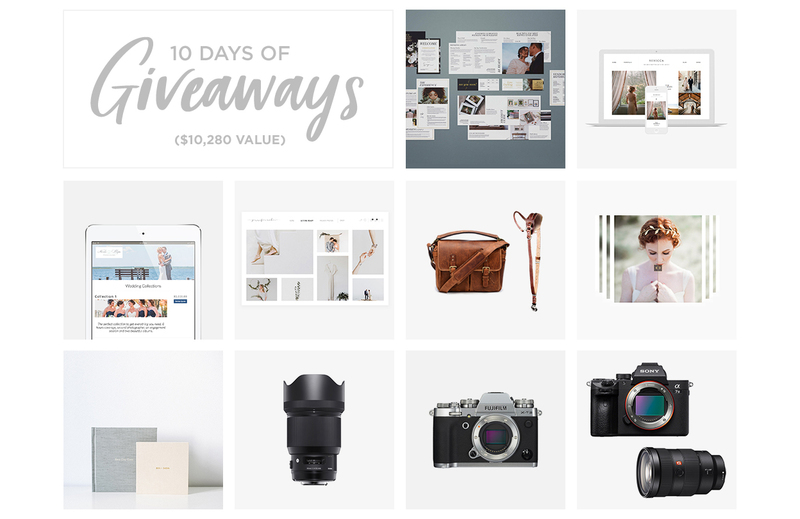 Helping photographers succeed is our passion, which is why we’ve partnered with some of our favorite brands to create the ultimate photographer’s dream package. We are giving away over $10,000 in awesome prizes through the end of October to 10 lucky winners. Winners will be announced daily on our SmartSlides Instagram page, so be sure to follow along for updates! Enter here for 10 chances to win. 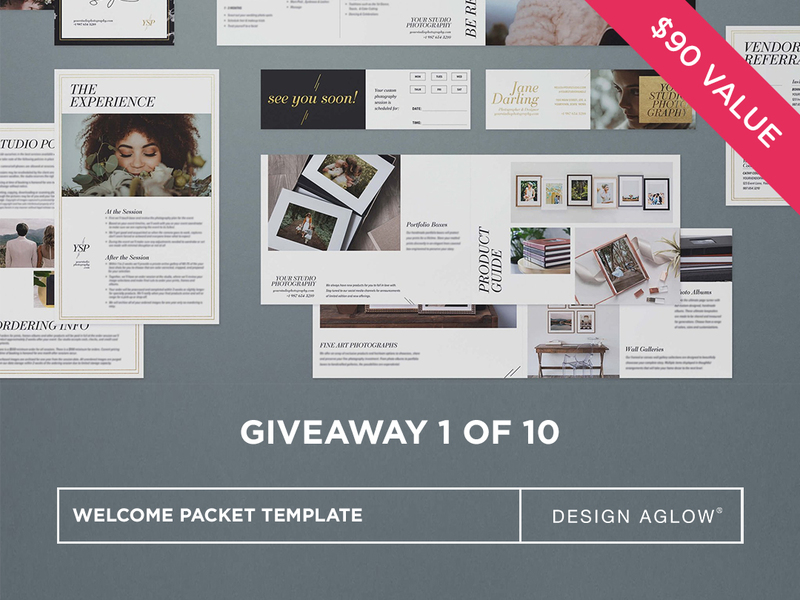 Prepare clients for their professional photography experience with Design Aglow original welcome packets. From a warm welcome message to tips for being camera ready, to product info to get them thinking about sharing and displaying their story. Each set is flawlessly designed with professional verbiage to build client confidence, highlight your brand and make the perfect lasting impression. 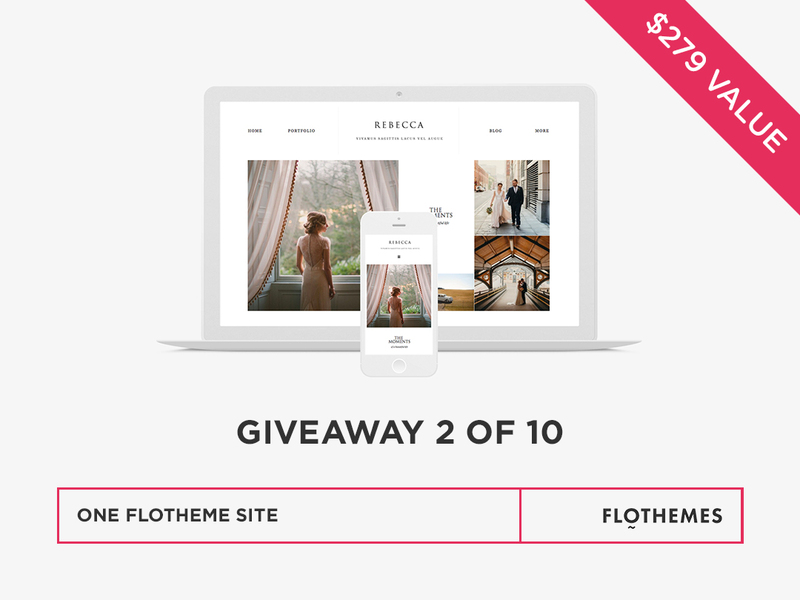 Bring your portfolio to life with Flothemes. Each WordPress theme has been crafted with photographers and creatives in mind. Each website theme is fully customizable, packed with features, pre-designed layouts & 40+ blocks that you can use to build unique pages. All themes are responsive and work seamlessly across all devices. 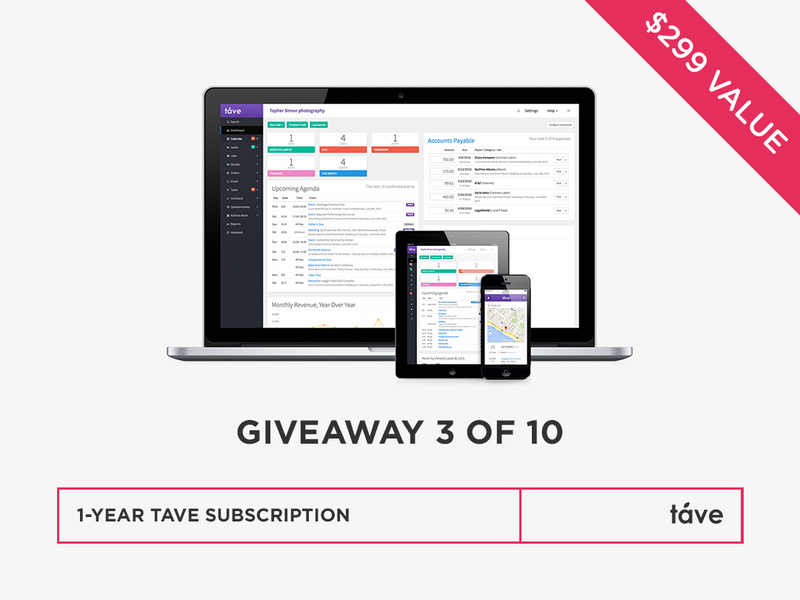 Improve your time management and organization with Táve, a business management software app for creative professionals. Táve assists you with the tasks you need to keep up with in order for your business to flourish. Now, you can easily get organized, grow your business, and take your business with you wherever you go. If you’re looking for a more efficient and impressive online proofing and gallery system, look no further than Pic-Time. Easily share online galleries, create a unique client store, and utilize marketing tools all from the same place. 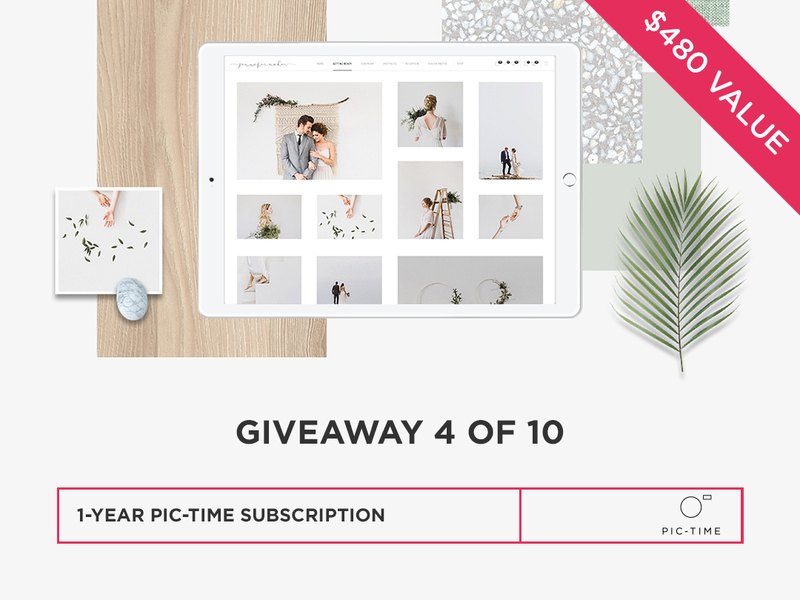 From online galleries to printed goods, Pic-Time provides one of the largest print stores available today, curated with products and lab companies from all over the world. 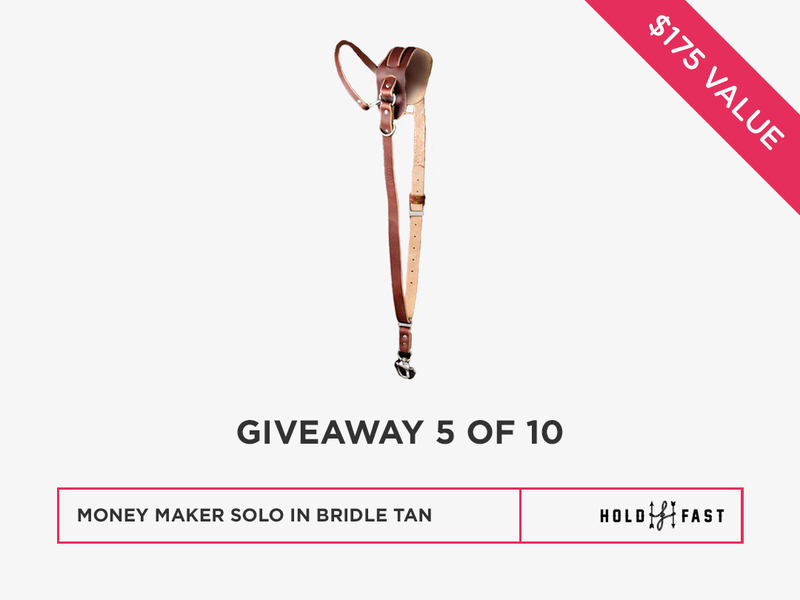 Upgrade your camera strap to this beautiful sling strap from HoldFast Gear. Not only is it comfortable, but it's sure to inspire you to pick up your camera more often. Made from high quality leather and hardware, it's the perfect blend of high form and function for the single camera user. 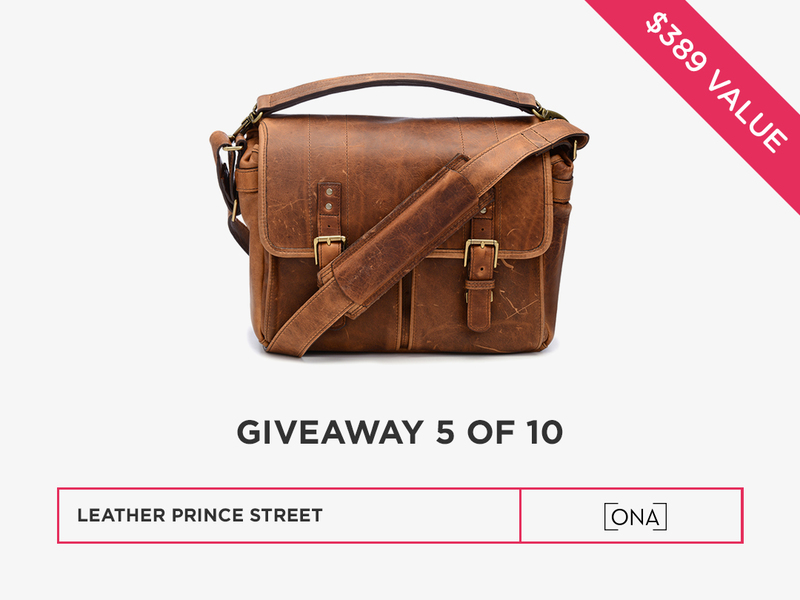 Handcrafted from gorgeous Italian leather, this Leather Prince Street from Ona Bags not only provides well-traveled aesthetic, but comfortably accommodates an 11-inch laptop or tablet, a camera, up to two lenses and small personal items. A slim removable top-grab handle and a streamlined back pocket offer added convenience and style. 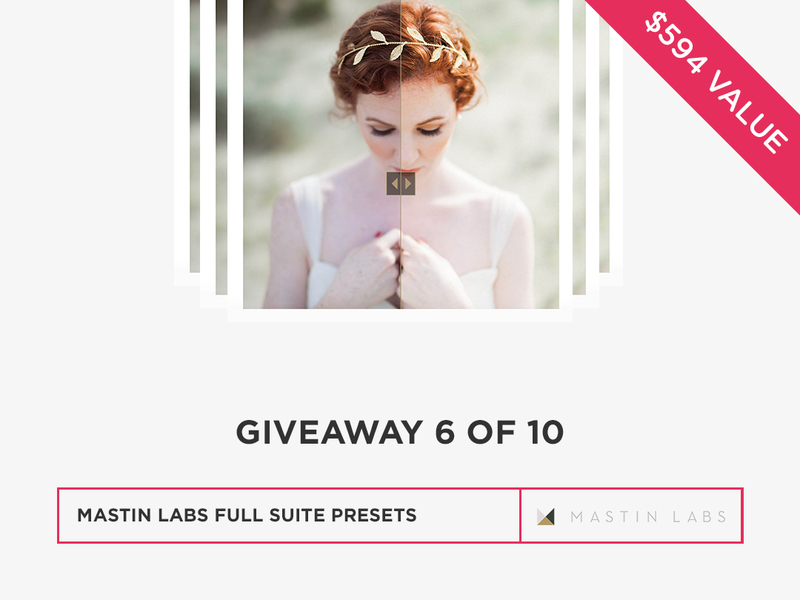 Mastin Lab film presets match real film—with results so precise even professionals can’t tell the difference. With the closest film emulation presets on the market, you can seamlessly match your digital work to your film work using either Adobe Lightroom or Adobe Camera Raw. 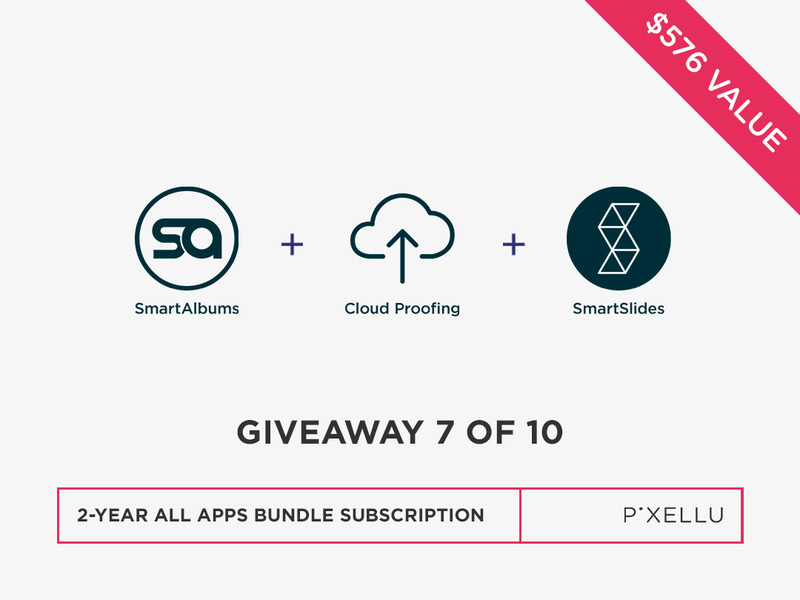 Get a 2-year subscription of Pixellu SmartAlbums, Cloud Proofing, and Pixellu SmartSlides Pro Plan, the must-have album design software, album proofing, and slideshow builder for the busy photographer. The perfect bundle making your workflow intuitive, quick, and simple. 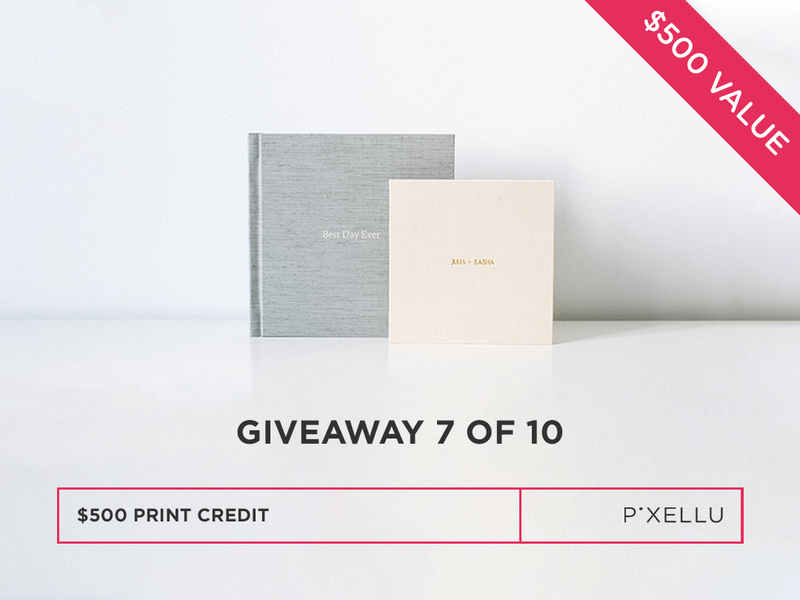 Get $500 to use towards any printing order with the album company of your choice. With hundreds of print labs to choose from, the options are endless! This stunning Sigma 85mm f/1.4mArt Lens is designed to achieve truly notable optical performance. Thefast f/1.4 aperture is perfect for getting images with an exceptional shallow depth of field and smooth bokeh. 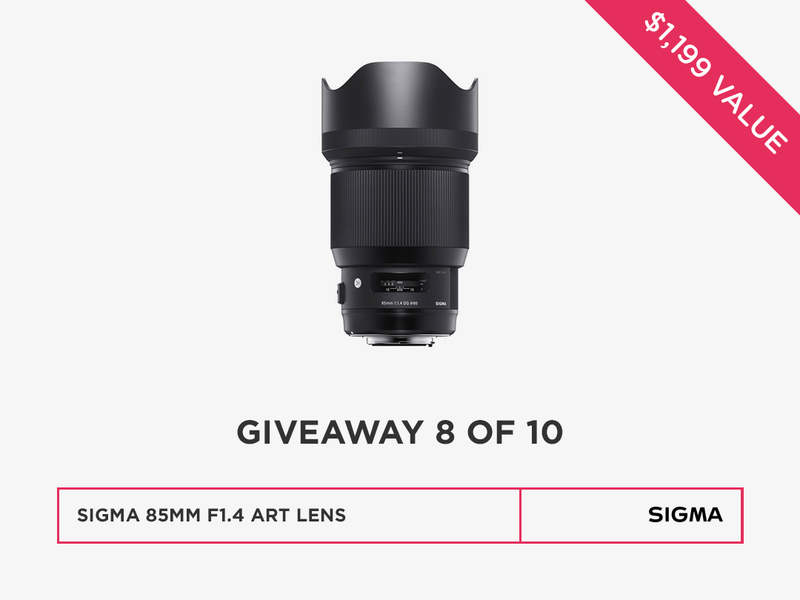 Winner chooses from a Canon, Nikon, or Sony mount. Take your photography to the next level with the stunning black Fuji X-T3 Mirrorless Digital camera. Designed for filmmakers and photographers alike, this versatile camera is well-loved for it's high-speed performance and multimedia flexibility. Featuring a newly developed image sensor & processor, 4K video, phase-detection autofocus, and so much more! The Alpha a7 III Mirrorless Digital Camera from Sony is a gorgeous well-rounded camera suitable for both photo and video applications in a variety of working situations. 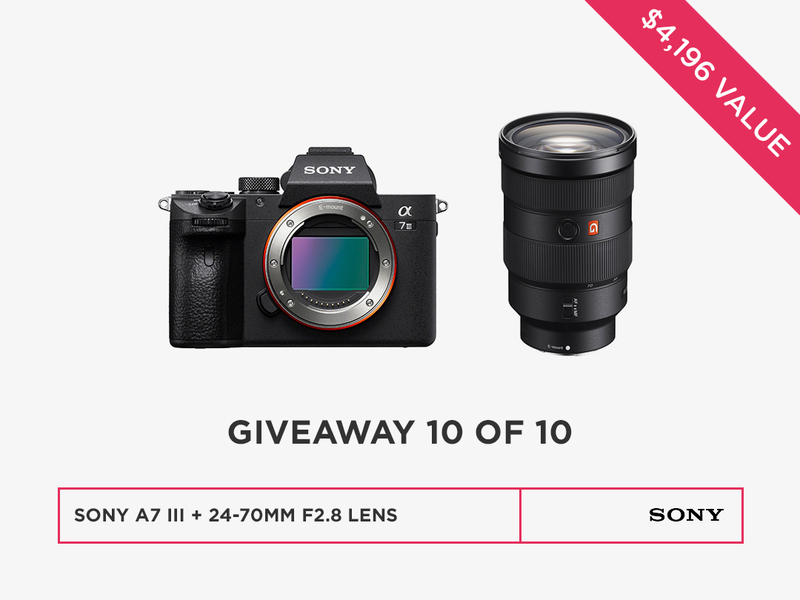 Pair your new Sony a7 with the top-of-the-line FE 24-70mm f/2.8 GM Lens. Take your photography work to the next level with it’s unprecedented union of high resolution and creamy bokeh. 10 prizes, 10 chances to win! Enter today and share with your friends to increase your chances. Winners will be announced daily on our SmartSlides Instagram page through the end of October.